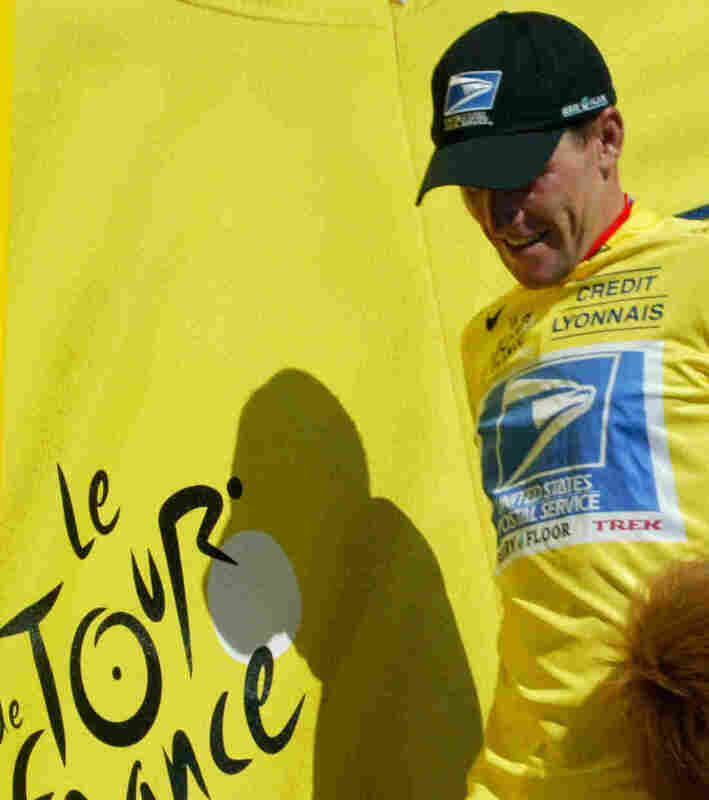 Lance Armstrong's Seven Tour De France Titles Are Effectively Gone : The Two-Way His decision to no longer contest doping charges means his records should be "obliterated," the head of the World Anti-Doping Agency says. Lance Armstrong, wearing the yellow jersey that identifies the leader in the Tour de France, during the race in 2003. He won that year and six other times. Cycling superstar and cancer survivor Lance Armstrong's seven Tour de France titles are about to be wiped from the record books. As NPR's Mike Pesca said early Friday on Morning Edition, while it is the U.S. Anti-Doping Agency that announced Thursday it would strip Armstrong of his titles — including the French records — because of the evidence it says it has collected that he was doping throughout his career, "the USADA is associated with the World Anti-Doping Agency." So the American decision will be honored in France, Mike says. "Greg LeMond is [now] the only American" to have officially won the world's most prestigious bicycle race, he told Morning Edition host Steve Inskeep. LeMond finished first in three Tours (1986, 1989 and 1990). The USADA's decision also means Armstrong will likely lose his bronze medal from the 2000 Olympics. And he may be banned for life from competitions. Retired from cycling, the 40-year-old Armstrong has recently been competing professionally in triathlons. "USADA cannot assert control of a professional international sport and attempt to strip my seven Tour de France titles. I know who won those seven Tours, my teammates know who won those seven Tours, and everyone I competed against knows who won those seven Tours." But John Fahey, head of the World Anti-Doping Agency, said today that Armstrong's Tour de France titles now need to be "obliterated" from the record books, the BBC reports. Armstrong "had the right to rip up those charges but elected not to," said Fahey, according to the BBC. "Therefore the only interpretation in these circumstances is that there was substance in those charges." Another way to look at Armstrong's statement, Mike said on Morning Edition, is as something of a "no contest" plea. Update at 12:10 p.m. ET. U.S. Anti-Doping Agency Takes Official Action. "USADA announced today that Lance Armstrong has chosen not to move forward with the independent arbitration process and as a result has received a lifetime period of ineligibility and disqualification of all competitive results from August 1, 1998 through the present, as the result of his anti-doping rule violations stemming from his involvement in the United States Postal Service (USPS) Cycling Team Doping Conspiracy (USPS Conspiracy)." "(1) Use and/or attempted use of prohibited substances and/or methods including EPO, blood transfusions, testosterone, corticosteroids and masking agents. "(2) Possession of prohibited substances and/or methods including EPO, blood transfusions and related equipment (such as needles, blood bags, storage containers and other transfusion equipment and blood parameters measuring devices), testosterone, corticosteroids and masking agents. "(3) Trafficking of EPO, testosterone, and corticosteroids. "(4) Administration and/or attempted administration to others of EPO, testosterone, and cortisone. "(5) Assisting, encouraging, aiding, abetting, covering up and other complicity involving one or more anti-doping rule violations and/or attempted anti-doping rule violations."